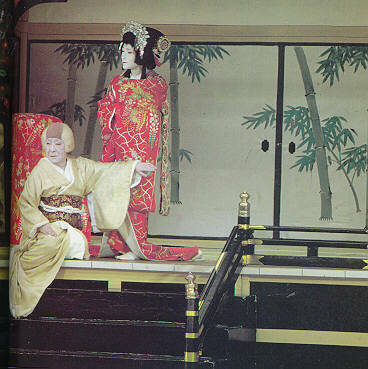 Kabuki is another form of traditional Japanese theater dating back to the 17th century. It was started by Okuni, a shrine maiden who performed in Kyoto in 1603. Although it was created by a woman, women were soon prohibited from performing (a matter of "public morals" in 1651) and since then all roles are played by men. (Some of the lead roles had been played by prostitutes, by the way.) The men who play the women are referred to as "onnagata", or female role specialists. 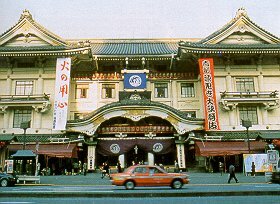 Shortly after the kabuki theaters were closed, though, they were reopened in 1653 under the proviso that all roles would be played by men. Kabuki plays can last up to six hours at a time with themes which are feudalistic in setting. The performers are accompanied by shamisen, flutes and drums with singing styles called naguta, tokiwazu and kiyomoto. The sashigane is a thin bamboo rod painted black so it can't be seen against the backdrop. At the end of the rod may be attached artificial butterflies or birds which can then appear to fly. Wires are generally used now instead of bamboo rods. 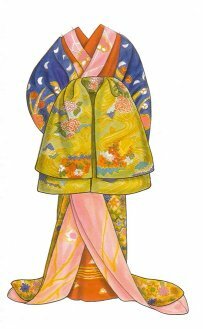 Costume changes may take place right on the stage in front of the audience. 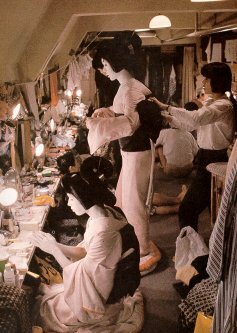 In addition, there are revolving stages called the mawari-butai, greatly aiding set preparation. This is also an aisle called the hanamichi which runs from the rear of the stage out through the audience. 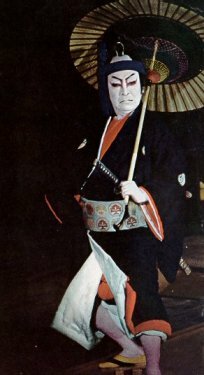 The term kakiwari refers to the various scenery and props used. The kuroko is a stagehand that comes onto the stage to help the actors but is not directly related to the play itself. The audience treats such a person as invisible. 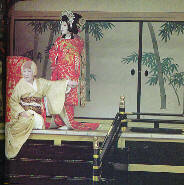 Juhachiban: the 18 best kabuki plays, associated with the Ichidawa dynasty of actors since the days of DanjoroI. 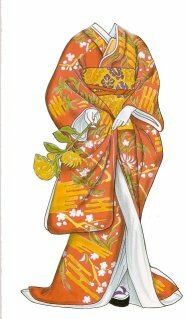 Akahime (red princess) costume worn by princesses and daughters of shoguns and daimyos in jidaimono. 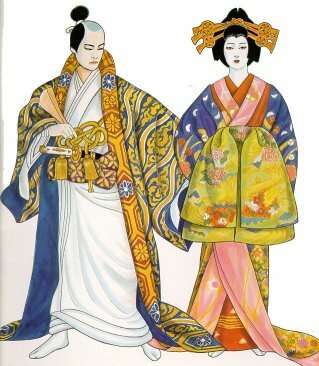 Yugiri (a courtesan) in Kuruwa Bunsho, or Tales of the Licensed Quarter, a sewamono.